You might think this is just another practice test book. However, our healthcare test prep isn’t like other study materials. 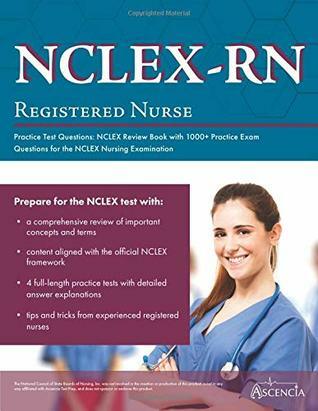 Because Ascencia Test Prep’s unofficial NEW NCLEX-RN Practice Test Questions : NCLEX Review Book with 1000+ Practice Exam Questions for the NCLEX Nursing Examination offers you real examples, graphics, and information, you’ll benefit from a quick but full review of everything on the exam! Our convenient materials will give you the edge you need to pass your exam the first time. ©2018 National Council of State Boards of Nursing, Inc. All Rights Reserved was not involved in the creation or production of this product, is not in any way affiliated with Ascencia Test Prep, and does not sponsor or endorse this product. This NCLEX-RN test prep book is an excellent study source. It gives more hands-on practice tests than most books that are in the same category. The book provides answers to the test questions. Also, it provides more than enough study content material to know before taking the examination practice tests. I recommend it to all.